You may wonder why this update is sent by me. 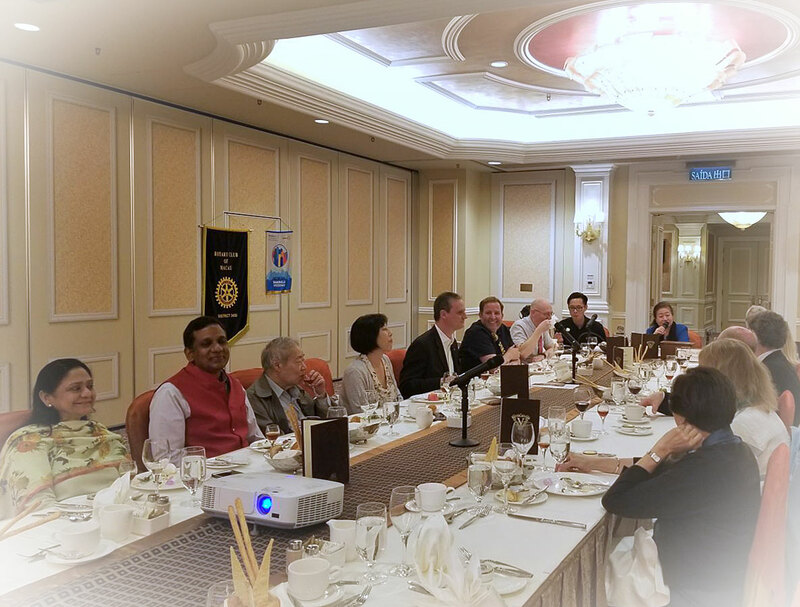 Our President Fatima was away in Hangzhou so I was to preside the regular meeting last Thursday 19/4. Pres. Fatima, IPP Sam, Secretary Synthia and Treasurer Ricardo were all unable to join our last meeting, leaving only me and PE Elvo sitting at the head table. Nonetheless, late comer PP Fred joined in so we wouldn’t feel too lonely at the head table at all. Besides, we also had PN Ip, Sgt. Ignacio, PP Guy and wife Vicky, PP Choi, Rtn. Joao, Rtn. Marc, Rtn. 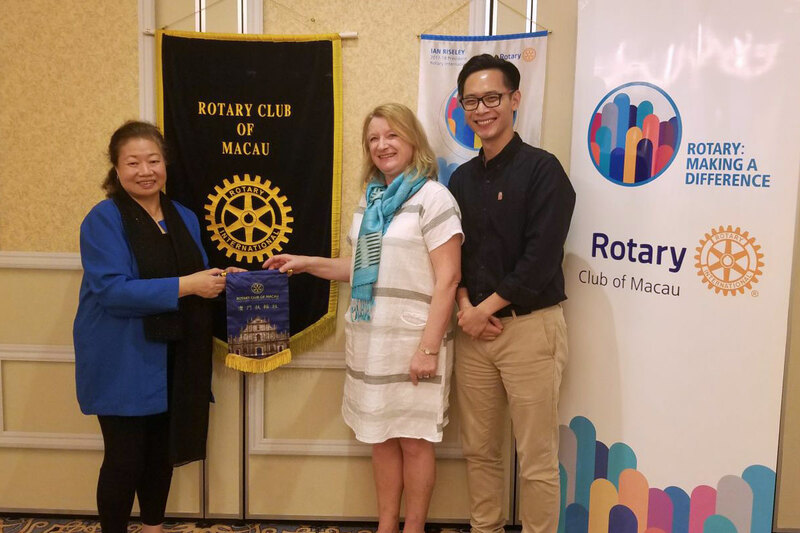 Yuko, PP David and wife Helen and sister Lynda Lees who is also a visiting Rotarian from Rotary Club of Ampthill in Bedfordshire, UK. We also had an Indian couple, visiting Rtn. Sukhir Kumar Agarwal of RC Delhi North and his wife from RC Delhi Devine. Senior Rotarians, please take a look at the attached photos, you may find visiting Rtn. Kumar looked familiar. 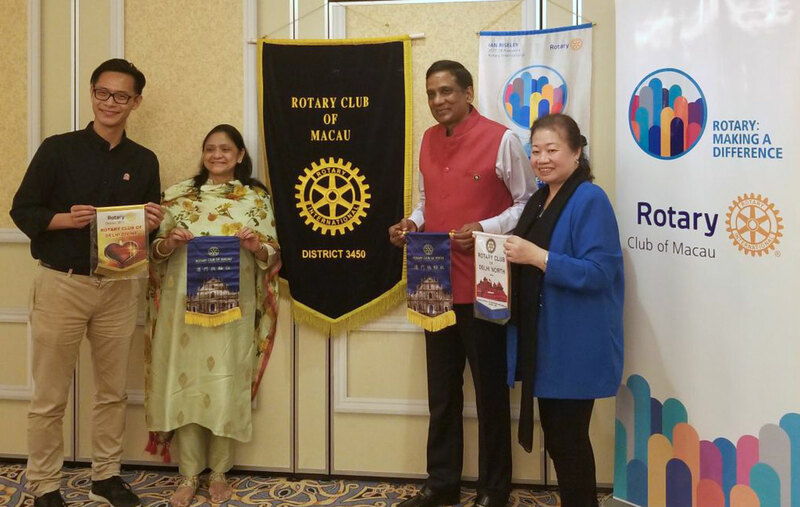 He was in Macau in the late 70’s and he owned the Indian shop at the Lisboa Hotel where we had our regular meeting then, he was once invited to attend Rotary meeting by PP Bien. He also recognised some of our members like PP Guy cos he was a frequent customer of the Crazy Paris Show. We had great fellowship and we exchange banners. After topping up by PP Fred, box collection is $700. The video crew of 4 were doing video shooting of members one by one for the opening of the HERO Ball at another room while we were having our meeting. Ball tickets are ready for collection today. Please be reminded that each Rotarian is responsible for at least 5 tickets. For payment of tickets, please bank in our account with BNU and remember to send me the bank in advise for record purposes.